The October 2, 2014 issue of the Troy Times-Tribune is off the presses! 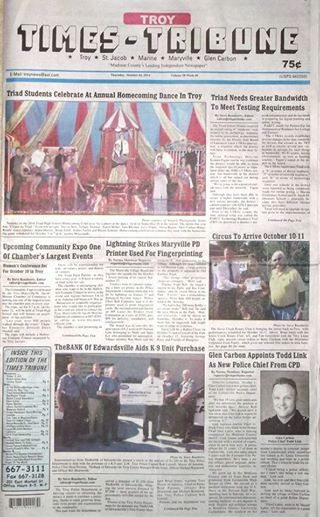 Some of the stories in this issue: Triad District Faces Bandwidth Challenge, Chamber Announces Community Expo, Lightning Damages Maryville PD Equipment, Circus Returning to Troy, Glen Carbon Appoints Todd Link As Police Chief, TheBANK of Edwardsville Donates Money for K-9 Unit, Mersinger Log Cabin to be Open for Scenic By-Way Tour; plus we have police blotters, a column about escalating tax rates, and two full pages of local sports coverage, along with a full page of photos of the Triad High School Homecoming Dance, and a whole lot more! We have obituaries for Robert G. Arlt, Johnny Garcia, and Robert Amner Droy.